It looks like a piece of Obsidian from our nearby lava flows, but it's Gnawt-a-Rock! This durable throw toy is inspired by natural volcanic glass formed by rapidly cooling lava from Pacific Northwest volcanoes. Unlike Obsidian, the Gnawt-a-Rock is made with natural latex rubber, with a faceted, gum-massaging surface. It looks like a piece of Obsidian from our nearby lava flows, but it&apos;s Gnawt-a-Rock! This durable throw toy is inspired by natural volcanic glass formed by rapidly cooling lava from Pacific Northwest volcanoes. Unlike Obsidian, the Gnawt-a-Rock is made with natural latex rubber, with a faceted, gum-massaging surface. Its irregular shape creates an erratic bounce, and it has a treat-dispensing design for interactive play and reward. 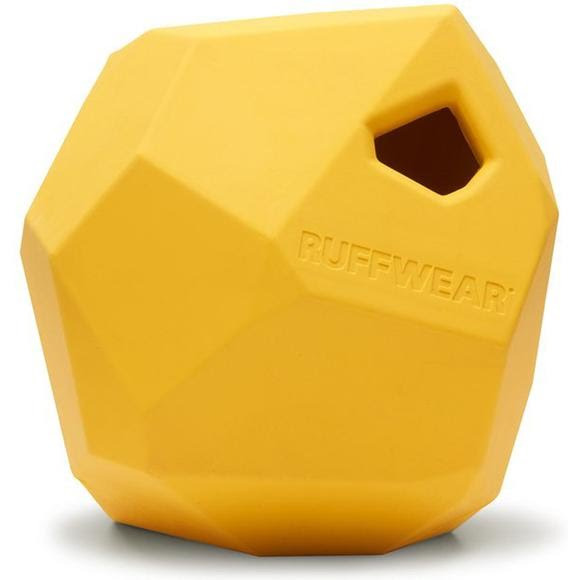 Part of the Pacific Gnaw-west toy collection inspired by Ruffwear&apos;s home of Bend, Oregon, and its natural surroundings. Internal chamber dispenses kibble or small training treats. Measurements Appx 6" x 5"